Near the WA/ID border on Interstate 90; 33 miles from Coeur d’Alene, Idaho; 289 miles from Seattle. Population: 212,000. Visitor Information: Downtown Spokane Visitor Information Center 20l W. Main, Spokane, WA 9920l; Phone: (888)-SPOKANE. Spokane Regional Convention and Visitors Bureau, 80l West Riverside Avenue Suite 30l, Spokane, WA 9920l; Website: www.visitspokane.com. 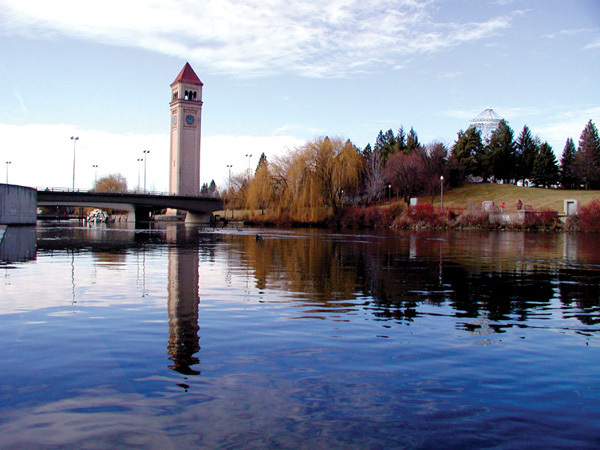 The hardest part about planning a visit to the Spokane Region is deciding what to see and do first, with all the shopping, dining, arts, indoor and outdoor recreation you could wish for, Spokane is a Northwest wonderland complete with natural beauty and fantastic weather. 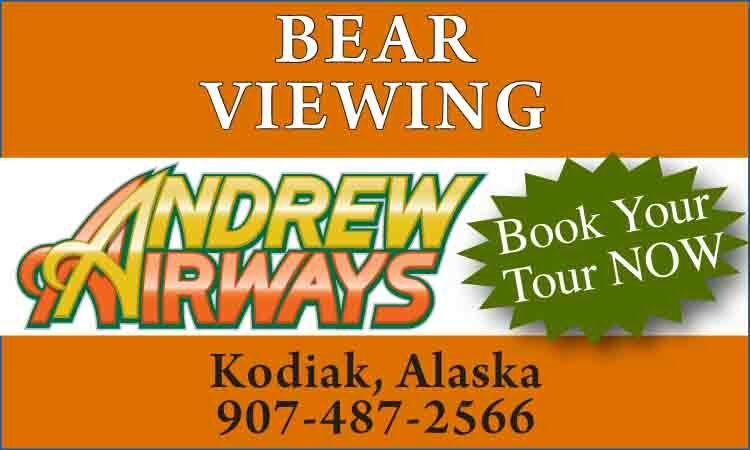 Request a visitor packet and plan to stop by one of the Visitor Information Centers when you arrive. 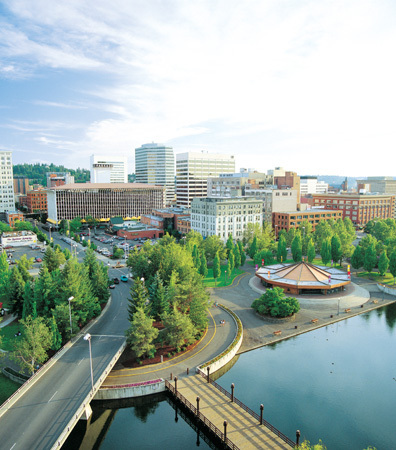 Spokane, known as the Lilac City, is the hub of a large area known as the Inland Northwest. It is a trade center for the 3-state region and also a gateway to outdoor opportunities located in this scenic area. 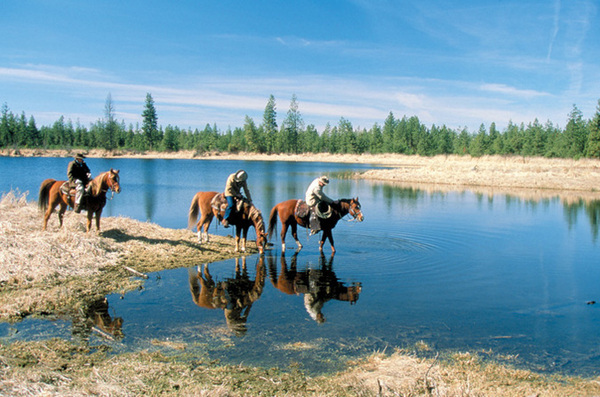 Spokane is so well located that a visitor can be horseback riding at a dude ranch, jet boating in Hells Canyon or water-skiing or fishing on Lake Roosevelt in less than two hours. There are 76 lakes within a 50-mile radius, over l,635 miles of maintained biking and hiking trails, five ski resorts and numerous forests, state parks and resorts. It was the river that first drew people to Spokane hundreds of years ago and it’s the river that continues to be the heart and the soul of the state’s second largest city. The Spokane River snakes through downtown, rumbles over one of the largest urban waterfalls in the United States and is the focal point of l00-acre Riverfront Park. It’s a four-season river that thunders in the spring with icy snow melt, turns placid and cool in the summer, meanders under brilliantly colored leaves in fall and runs cold and steady in winter. 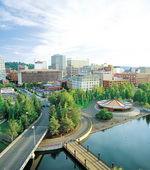 Spokane has a wide range of lodging choices from budget-priced to luxury level. 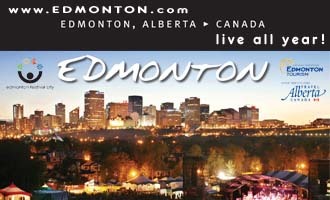 The city has many full service hotels, bed and breakfast inns and several "boutique" hotels. On the outskirts are numerous motels, RV parks and resorts. You can also rent RV’s in Spokane. In the heart of the City, l00 acre Riverfront Park is filled with peaceful spots and scenic views. Ride an antique carrousel, a gondola over Spokane Falls or stand on a suspended bridge to view the Spokane Falls. Visitors can rent bicycles or in-line skates and make their way toward Idaho on the Centennial Trail. Check out the Spokane Calendar for park events at www.visitspokane.com. Spokane golf courses beckon visitors also. Affordable, accessible and diverse describe the nearly 20 courses located within an hour’s drive of town. Golf Digest magazine described Spokane as "a golf mecca...a refuge of wondrously cheap, unpretentious, high-quality golf." Garden lovers will enjoy the many gardens at Manito Park of Spokane’s south hill. A perennial garden, rose garden, rock garden, Japanese garden, formal French Renaissance-style garden and conservatory are all open to the public free of charge. Those interested in indoor activities can shop to their heart’s content in the newly renovated downtown shopping district or at two large malls, Northtown and Spokane Valley Mall. A l3-block skywalk system links shops and restaurants throughout the city. The Post Falls Factory Stores located east of the city provide the discerning shopper with generous bargains. Entertainment abounds in Spokane with major events at the Spokane Arena, Opera House and the Metropolitan Performing Arts Center. A number of casinos are located in the surrounding area. Spokane’s beautiful l00-year old buildings recall the city’s rich, colorful history. Visitors can step back in time with dinner at an historic mansion or a visit to a historic neighborhood. The Northwest Museum of Art & Culture, the most inclusive Museum in the Inland Northwest, reopened in Fall of 200l with an expanded Museum complex featuring five galleries, a new visitor center, a cafe, Museum store and outdoor amphitheater. The Museum features the largest Native Plateau Culture collection in the world. Part of the Museum complex is the Tudor revival-style Campbell House which was built in l898. Guided tours with rich anecdotes of family history and household operation are conducted daily. The Cat Tails Rescue Facility, north of Spokane on Hwy. 2, saves abused and unwanted big cats: Cougar, Bobcat, Bengal Tiger, Lion, Leopard, Jaguars and more. Visitors are welcome.